Andreas Mettler was a fairly prolific developer in Germany in the mid 80’s, doing a large number of PD games, as well as a few commercial ones too. With the amount of games produced, you’d understand how it might be possible to forget about one of them – even to release it maybe? That is exactly what happened with Bongo King, a graphic text adventure, written in 1986 by Andreas. At the time, Andreas was into Disney comics, and wanted to do a game based on Scrooge McDuck – to avoid any copyright issues, the characters were not drawn to likeness, and references were not included. Unfortunately due to my poor lack of multi-lingual skills, I am unable to play the game myself – with the game being completely in German. It looks great though, and many people i’m sure will enjoy the game! “I’ve always been quite forgetful. Not enough that I barely had memories of my game Bongo King until a few months ago, apparently I had forgotten already in the 80s, to publish the game. And so Bongo King is now a C64 game that was indeed fully completed 30 years ago, but that has yet almost no one saw until today. That should change now. With the help of Volker Rust and Stephan Lesch all original files are now together again for this game and with a few hours time invested (and from many views in the source code), I could reconstruct the walkthrough. The cave without H Bongo King is a text and graphic adventure game from the year 1986. I had once again begun at this time Disney comics to read and wanted a known rich duck behind a small tribute. To defile not any copyright or trademark does not appear this drake naturally in Bongo King. It is about a man with a split personality, who considers himself to Scrooge McDuck. So much for my former image of schizophrenia. And this first nameless man comes in fact in the history of the game to wealth and takes the player as a nephew aside to hide his treasure on the desert island “Bongo”. And here begins the adventure story full of intrigue, dangerous stunts and mysterious hiding places. And when I read the end of the adventure after 30 years, I myself was particularly stunned. This bold idea, I would have the boy who I was then, not have expected. 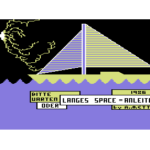 Go diving with life jacket … In this video game C64 are 25 screenshots shown. In fact, there are still marvel at a few more graphics that are particularly appropriate when the player is lost on the wrong track or entirely. The video should show the perfect solution, the other scenes give but some clues as to why the story has developed in the way it was told.